Displays basic principles of electromagnetism. 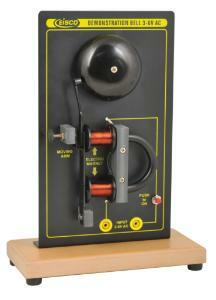 This labs electromagnet bell shows the basic principles of electromagnetism. To active the bell, there is a push button to completed the circuit. All components are visible along with wiring so students can understand the operation of this model. This Labs electromagnet bell shows the basic principles of electromagnetism. The model is equipped with two 4 mm banana plugs outlets for a external power supply to operate this demonstration. To active the bell, there is a push button to completed the circuit. All components are visible along with wiring so students can understand the operation of this model. All pieces are made of rigid materials which are mounted on a metal plate which is attached to a 8" x 4" wooden base. This stands approx. 11" Tall. Power supply is NOT included. Ordering information: Power supply is not included.